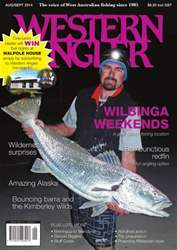 The August-September Western Angler features shore fishing expert Tim Farnell on the cover with a lovely mulloway. Inside, Farnell looks at the great shore fishing on offer at Wilbinga, just north of Perth. Luke Church offers his tips for catching tasty redfin perch and Scott Coghlan turns up some great surprises while kayak fishing in Exmouth Gulf. Mark Davis explores mothership barra trips in the Kimberley, while Robert Vaughan takes the Travelling Angler to Alaska on a trip to remember. John Bormolini explores shore fishing south of Mandurah, while Darryl Hitchen looks at the Abrolhos Islands. Plus plenty more, including a look at Bluff Creek, near Albany, an unusual trip to Malaysia and a special day of kayak fishing. There’s some great video footage too!